Toronto city staff are looking for feedback from the public Monday evening on three proposals for the re-design of King Street in a pilot project that will see an overhaul of the arterial road from Bathurst Street to Jarvis or Parliament Streets. All three designs focus on transit, dedicating lanes of traffic to streetcar flow. "The overall objective here is to prioritize the transit movement," said Jennifer Keesmaat, the city's chief planner. "A lot of people, quite frankly, have given up on transit along this corridor," Keesmaat said. "It's the most rapidly densifying area of the entire country and yet the transit service is pretty compromised." See the three proposed plans below. In the alternating loop model streetcars are given priority, with separated lanes in the centre of the street for both eastbound and westbound streetcars. It is referred to as an alternating loop because every other block vehicle access is limited to local traffic, meaning delivery vehicles, taxis and people who work and live on the block. The alternating blocks will have full public access. No vehicles will be able to make a left hand turn, crossing the streetcar lanes. In this model there is also extended "bump outs" on the sidewalk on the alternate side of the street being used for vehicle access, giving pedestrians more space. 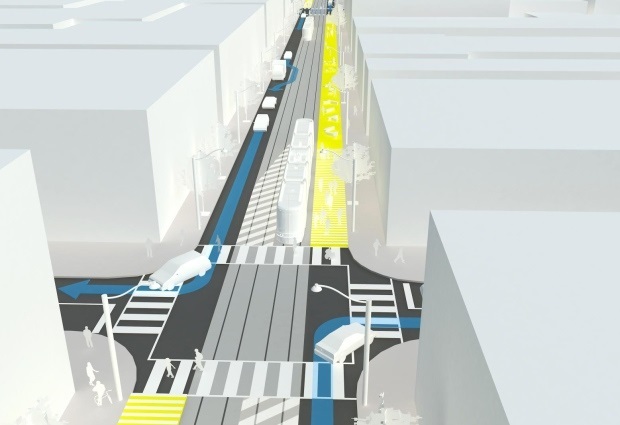 As the title suggests, this design provides physically separated lanes for streetcars. This model keeps vehicles on King Street moving in both directions, but vehicles still won't be able to turn left and stopping curbside will be forbidden. Unlike the alternating loop design, this model doesn't include additional space for pedestrians, instead keeping the sidewalk portion of King Street as it is now. "This option means that you have servicing and loading happening right along the street side," said Keesmaat. "You no longer have street-side parking but you in fact, might run into a scenario where one car stops to drop someone off and all the other cars are stopped behind it because they don't have a way out." With the transit promenade proposal, pedestrians would be given preference on the King Street corridor stretching from Bathurst Street to Jarvis or Parliament Streets. 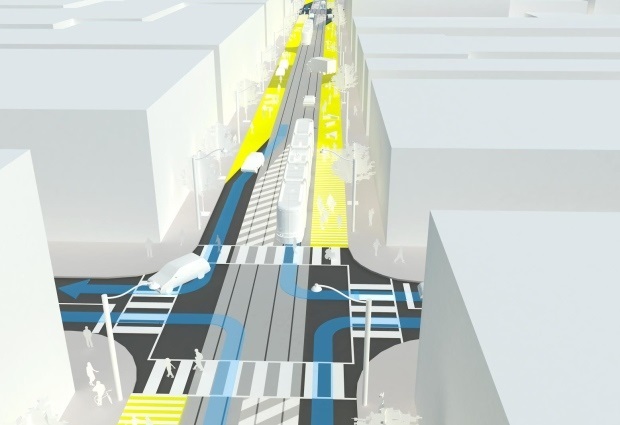 "Imagine the sidewalk doubling," Keesmaat said. 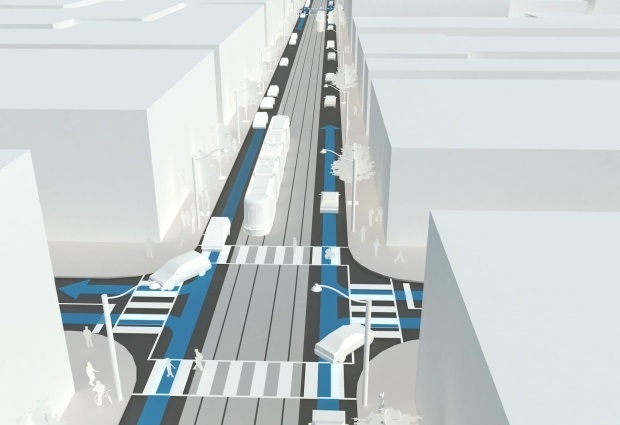 It also includes accessible curbside boarding for streetcars at all stops along the street, and dedicated streetcar lanes, though they won't be physically separated.